24 in. (540) Primo Sentinel 12 Spoke Wheelchair Wheel and Tire is a premium wheel assembly designed for the active wheelchair user and is a great compliment to many rigid and folding wheelchairs. Hub width (from bearing to bearing) is 2"
Fits a variety of wheelchairs from Invacare (Top End), TiLite, Quickie, Colours, or any other brand needing a 540 mm size. This wheelchair wheel fits wheelchairs using a 1/2 inch diameter axle bolt or 1/2 inch diameter quick release axle. To know if your existing axle will work, add the width of the hub (2" - measured from bearing to bearing) and add it to the length of your axle carrier tube on the wheelchair and add approx 1/2" for the axle nut. If the axle is not long enough you will need to get a longer one. If you are using quick release axles, the length of the axle is measured from the underside of the adjustment nut to the start of the retractable ball. Most quick release axles have an adjustment up to a 1/4" for a snug fit. The included tires are the 24 x 1 in. 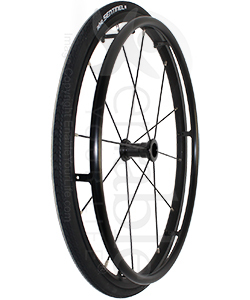 (25-540) Primo Sentinel Wheelchair Tire with Flat Guard. These tires feature a layer of material under the tread providing increased resistance to punctures that are caused by a variety of objects including glass, stones, thorns, etc. Being more resistant to flats does not make them flat free but provides that extra layer of security that may help prevent your next flat tire. Maximum PSI is 100 and the inner tubes have the standard schrader valve for convenience. When its time to replace the tires, the rim will accept any standard 540 mm pneumatic or solid tire.